During 11-15 August the South African Association for Child and Adolescent Psychiatry and Allied Professions (SAACAPAP) will host the 21st World Congress of the International Association for Child and Adolescent Psychiatry and Allied Professions (IACAPAP) at the International Convention Centre in Durban, South Africa. 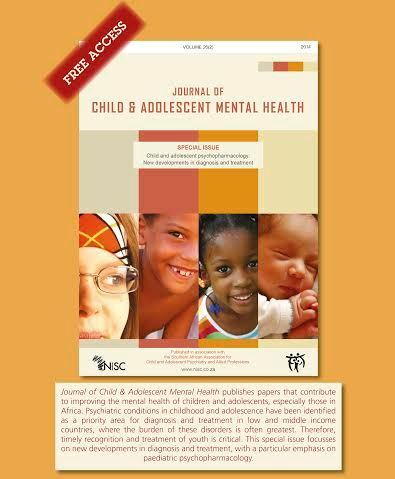 The official publication of SAACAPAP, the Journal of Child & Adolescent Mental Health, will make the conference abstracts available in a special, conference only, print version of the journal. The booklet will feature the journals latest special issue titled "Child and adolescent psychopharmacology: New developments in diagnosis and treatment." Delegates at the conference will also receive a token entitling them to a period of free access to the entire journal archive on Taylor & Francis Online. NISC will be co-exhibiting at the 2014 IACAPAP Congress with Routledge. We look forward to seeing you there.